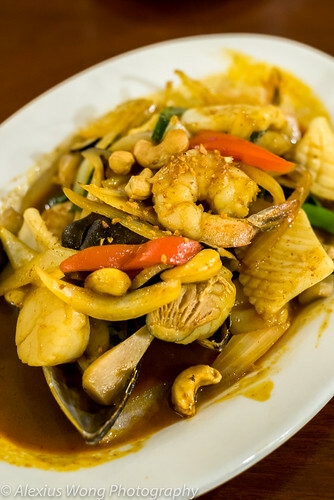 Thai restaurants abound in the DMV area in which such establishments can be found in most neighborhoods, particularly dotting affluent or ethnically-populated ones. As much as they make their presence in these parts of town, they are not as visible in the eastern sections like Prince George’s County, MD and Southeast DC, for which I have griped about in previous blogs. Since last summer, I have been noticing Thai Orchid Kitchen located in an improbable spot, at one of the busiest intersection in Anacostia, DC. Since a friend, with whom I would meet up once in a while, lived fairly close by, we paid it a visit during lunch one afternoon, and I was quite impressed by the meal. Subsequent meals there enticed me to drop in a number of times, hence enough dishes were sampled for this most tardy blog. From the outside, the windows bars can be a bit unnerving to the uninitiated, and walking in, the dining area appears rather spacious despite the building’s shotgun-like appearance. After perusing the rather large menu, I decided to open my meal with a couple of classic soups. The first was Tom Ka. The bowl arrived filled with a whitish coconut cream-based liquid stained by some chili oil covering bits of chicken and mushrooms, and made aromatic by pieces of the obligatory lemongrass and galangal root. After giving the soup a stir since the cream tends to rise to the top, I took a good sip. Creamy and aromatic it was, but I was taken aback by a good hit of sourness and saltiness coming from both fish sauce and lime juice. Alternating sips with bites of my main dish only confirmed the overwhelming seasoning which begged for some taming. 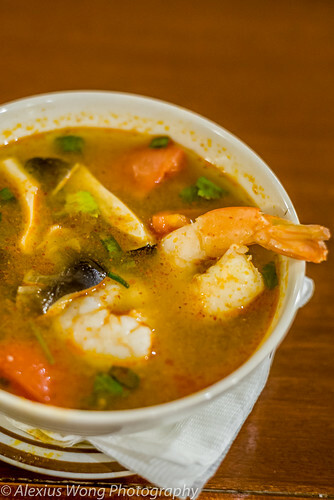 The other soup was the recognizable Tom Yum Shrimp. The hot liquid was perfumed by lemongrass, galangal root, and thin slivers of Kaffir lime leaf. Pieces of shrimp were both sweet and plump and the bowl was chockfull with straw mushroom and tomatoes. However, the disappointment lied in the seasoning, which, like the above, was replete with too much fish sauce and lime juice, this further exacerbated by too much sugar in this case. 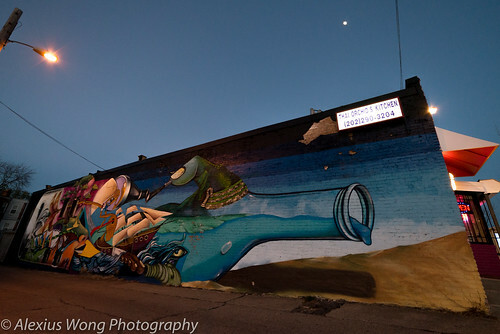 Although both soups require bold flavor ingredients, finesse in the balancing act of their elements is the secret to their success – the owner noted that his customers love fish sauce, but this was an overkill. In this kitchen, all the elements are there but the soups need some tweaking. However, these openers did not damper my curiosity of discovering the rest of the kitchen’s menu. 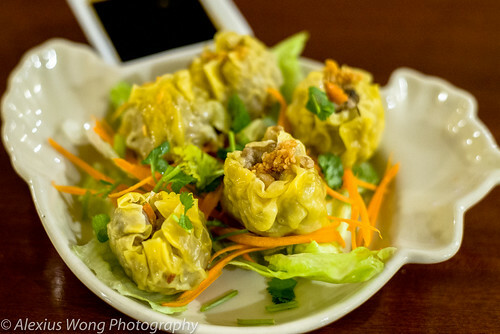 A favorite appetizer of mine from this Southeast Asian cuisine is Steamed Dumplings. One bite into them was revelatory. They tasted freshly made with the skins supple from the steaming, and the stuffing enticing with a savory mix of ground pork and shrimp, exuding an a la minute quality in each mouthful. The side of dark soy sauce was the perfect accompaniment with its slightly sweet dark molasses alongside its soy umami saltiness. The owner exclaimed that this was a big seller hence their freshly-made quality and flavor, which my dining companions raved about. Admittedly, this is one of the best versions I have eaten in the area. Another meat appetizer that equally impressed me was Chicken Satay. 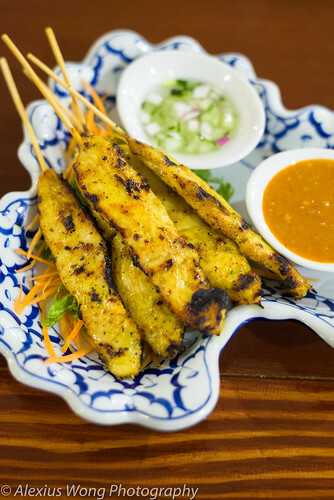 The skewers of meat were not the plainly seasoned ones found in most establishments. Here, the meat was properly grilled but still moist with hints of root herbs of galangal and lemongrass, colored by a hit of yellow turmeric. 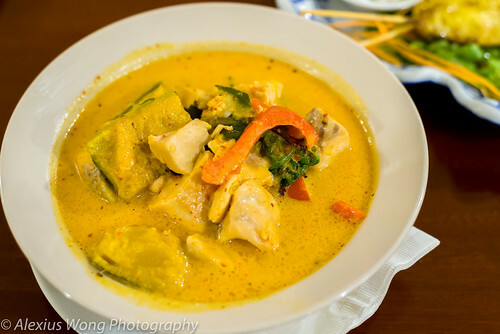 But it was the peanut sauce that sealed the deal with its nutty sweet and creamy mix echoing the use of the root herbs in the bites. Two good appetizers indeed. Thai cuisine is known for their salads, and I had to taste a couple of them here. The first was Pla Goong or Grilled Shrimp Salad. 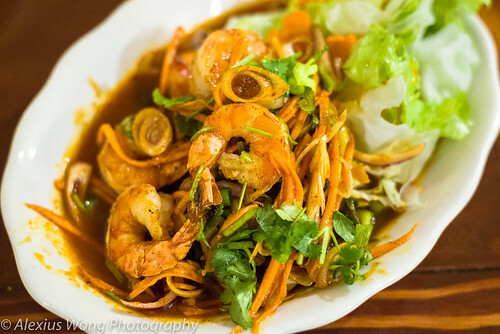 The butterflied seafood came grilled and paired with carrots, lettuce, cilantro, and lemongrass, all brought together by a rather spicy, sweet and sour dressing. The salad was fairly tasty and each bite was made interesting by the bits of lemongrass that exuded a root citrus flavor. However, the dish was marred by the unseasoned and dried out shrimp that was crying out for some marinade that would have added flavor and moisture to the protein. 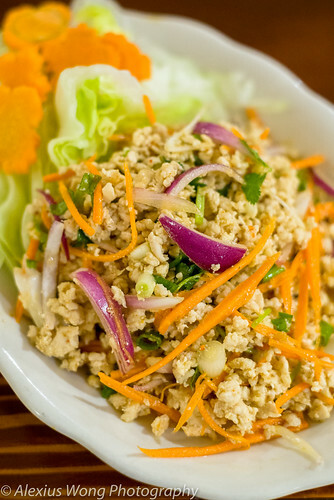 Larb Kai was the other order. This traditional salad consists of minced chicken seasoned with dried chili flakes, lime juice, and toasted rice powder. The dish was still warm from the freshly cooked chicken but it tasted slightly under seasoned upon the first spoonful. Perhaps my tastebuds were slightly numb by the heavily seasoned grilled shrimp salad, but after a while, I was beginning to appreciate the subtleties of the chicken salad. With a bit more chili flakes and toasted rice powder, the dish would have scored highly in my books. A couple of fried seafood dishes were also sampled. The first was the Fried Calamari appetizer. Rings of battered squid rings arrived with a florescent red sweet sauce. The pieces of seafood were a bit heavily battered despite it description of “lightly battered” in the menu. Despite this issue, the squid was quite tender, this being quite a tall feet for most kitchens. The main order of Crispy Seafood Basil suffered the same treatment as the calamari. 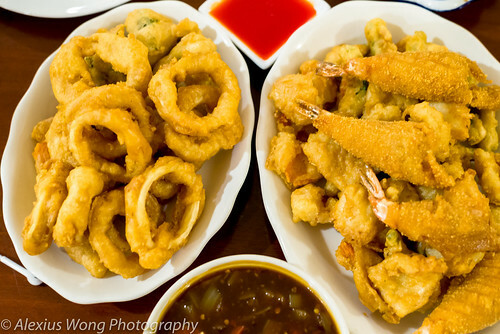 The pieces of shrimp and fish were also heavy from both the batter and frying which made the dish a bit overwhelming and quickly filling. But I appreciated the pieces of battered green beans and carrots paired with a decent spicy garlic basil sauce, albeit a bit over thickened. 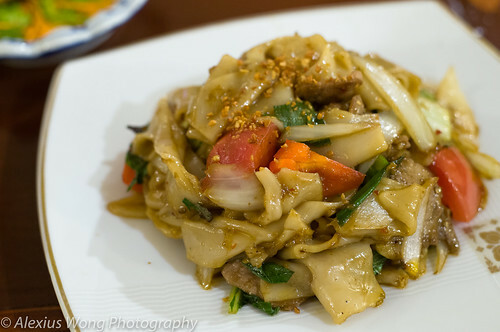 The dish that impressed me about this kitchen during my first visit was Drunken Noodles. The version here is a good mix of fresh wide rice noodles, sweet white onion, green onion, ripe tomato, and a choice protein. The slices of pork I chose each time were fresh and devoid of the “porky” scent usually found in that meat. But what pulls the elements together is the sauce that moistens the dish as well as the high-heat wok searing imparting a slightly char flavor. The sides of chili pickles and paste are the obligatory accoutrements to add more acid and spicy interest, as if the dish were not flavorful enough. This dish is definitely a lunch favorite of mine, including the well-made version here. Another lunch dish I tried that caught my attention was the classic Kaprow Basil. However, during a dinner visit with a friend, his order was not quite what I had eaten for lunch. 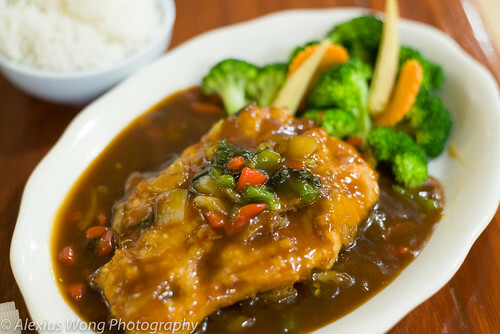 The dinner version was made with slices of chicken breast, sweet pepper, sweet onion, and green onion, sitting on a pool of brown sauce, devoid of basil leaves, reminding one of Chinese food. On another visit, I spoke to the cook’s sister and I asked for the traditional version. 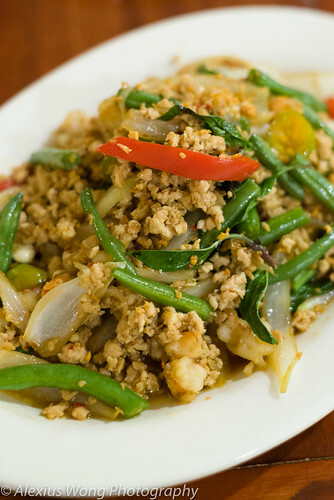 This time, minced chicken and shrimp were paired with long beans, sweet onions, and a handful of fragrant basil, sitting on a bare pool of proper sauce made with fish sauce and some soy. This version was more delectable although it yearned for a bit more chili heat and saltiness, which would have made the dish soar. A trio of other seafood dishes caught the attention of me and my dinner companions during our visits. Salmon Curry with Pumpkin arrived with the bowl filled with large chunks of salmon and pieces of Kabocha pumpkin, covered in a slightly sweet yellow curry that was spiced by its usual suspects of cinnamon and cloves, all made velvety by some rich coconut cream. The pieces of fish were amazingly moist and fresh-tasting and the pumpkin being the kind that didn’t overwhelm the palate with its sweetness, which complemented the whole dish. The various elements in the dish came together beautifully and my friend seemed very pleased with his order. Another order placed by him was a similar fish dish – Crispy Salmon. When the dish arrived, it took him by surprise. The fillet was quite heavily battered and it was fried crispy, which was unexpected and to his dismay since he has an aversion for anything deep fried. After much griping, he managed to scrape the top off and started to appreciate the moist salmon and the flavors of the sauce despite its over-thickened consistency. 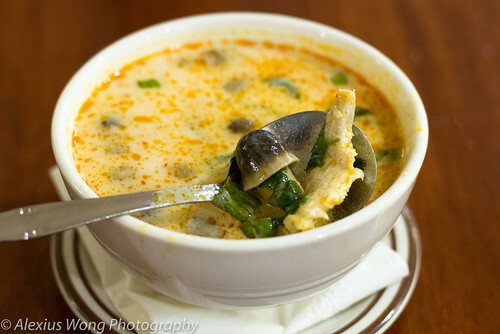 My order one night was Seafood Prik Prao which was listed as a special on a hand-written menu. Wow! Everything on this dish impressed me starting with the freshness of the seafood (shrimp, tender squid, perfectly cooked sweet scallops, and mussels (not frozen)), to the red chili paste that made each bite tantalizing with its spice heat and well-balanced seasoning. The pieces of cashew nuts added another layer of taste and textural interest along with the fresh oyster mushrooms that exuded some silky lusciousness. It was assuring for me to know that the kitchen will cook any of the specials even if the special menu was not on display, for which I will be ordering in the future based on this offering. 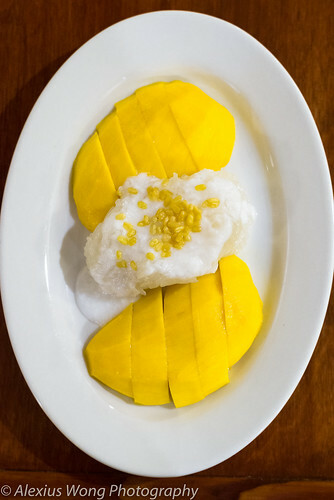 After our meal one night and feeling very sated, we were recommended by our waitress to try Mango and Sticky Rice. Reluctantly, I probed her about the ripeness of the mango, and she reassured me that they were the smaller ones that were at their prime. Taking her word, we placed the order and the dish indeed echoed her thoughts. One bite reminded my senses what a good ripe mango tastes like, especially after a winter of unripen tropical fruits. But it was its accompanying sticky rice that was doing its darnest to wrestle my attention with its perfectly steamed grains (a tall feet for most kitchens), perfectly seasoned with salty coconut cream that made it the perfect foil to the sweet fruit. The obligatory yellow lentils added the crunch to the pairing of soft elements, making each bite more irresistible. This dessert was a definite hit and perfect sweet ending for all those present at my table, and I’m looking forward to more of its order in the upcoming summer months. There were many highlights at Thai Orchid Restaurant, from the Chicken Satay and Steamed Dumplings appetizers, to the Larb Kai Salad, the Drunken Noodles, the traditional style of Kaprow Basil, the Salmon Pumpkin Curry and Seafood Prik Prao, and the quintessential and perfectly-made Thai ending – Mango and Sticky Rice. There were some dishes that left us nonplussed due to either their over seasoning or a lack of traditional approach in order to cater to the locals in the area. But once one can overlook some of these dishes, the diner can appreciate the well-seasoned and properly cooked aforementioned dishes that make this place worth recommending, especially in this part of town that has made this establishment very popular with delivery orders. Time to head back there soon and end the next meal with that scrumptious mango dessert!